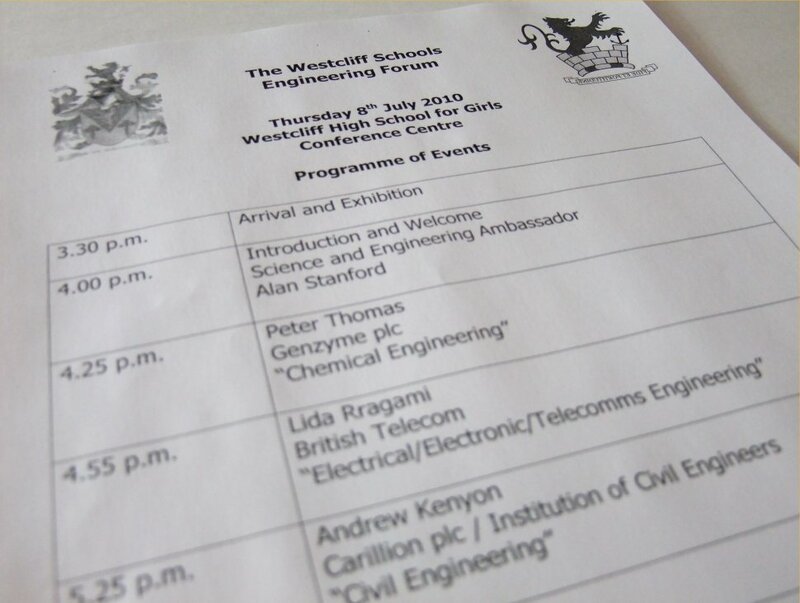 On Thursday 8th July 2010 I was at Westcliff High School for Girls to present at their Engineering Forum. The forum is an anuual event with the aim of encouraging students into careers in the various engineering disciplines. I was there both as a Professional Civil Engineer and in my capacity of Chairman of the Essex Branch of the institution of Civil Engineers and I had a 30 minute slot to sell Civil Engineering as a career. I was ably assisted by Grant MCConochie of VolkerFitzpatrick who did a five minute slot of his experiences working for a major civil engineering contractor. The event was well attended by students and parents from both Westcliff High School for Girls and the adjacent Boys school and was compered by Chemical Engineer and Science & Engineering Ambassador Alan Stanford. Alan opened the event with an introduction to the role of and need for Chartered Engineers and the various branches of engineering that were available. He included details of the salaries that could be expected as Chartered Engineers both on starting as graduates and later as Chartered Engineers. The first presentation was on Chemical Engineering and was given by Peter Thomas a retired chemical engineer who was employed by genzyme plc for many years. Peter did a very interesting presentation based around the discovery and production of Penicillin and the role of chartered engineers in the current production of antibiotics. Next up was Lida Rragami of British Telecom who gave an interesting presentation on herself and he career as a Chartered Electrical Engineer working in the telecommunications part of the industry. Whilst there were relatively few open questions to the speakers, Grant and I answered various individual queries from those interested in Civil Engineering and it was encouraging how many of thosde attending did have some degree of interest in it as a career.